Wash the broccoli, cut up its florets, chop the stem and parboil it in salted water. Meanwhile take the skin off the sausages. Cut up the Auricchio cheese into approximately 2 cm thick dice. Lay out the pizza dough cut into in strips (otherwise take small bits of it, spread them out with your hands in order to obtain a small disk) and fry it until it gets brown in colour. 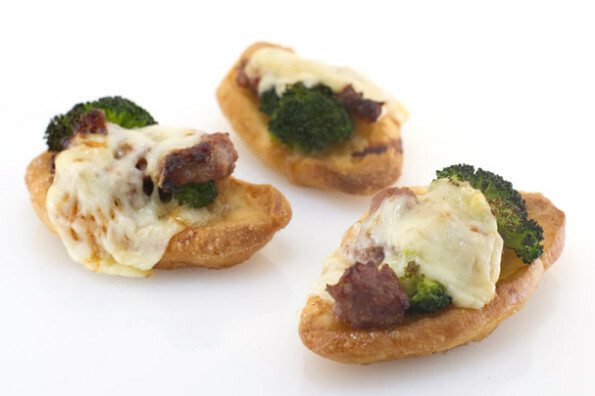 Put two broccoli bits, the sausage meat and the Auricchio cheese on the fancies, then place the so-composed little pizzas on a baking tray and bake for 5 minutes at 190°C. If you want to serve this dish to a vegetarian, just leave out the sausage and replace it, if you prefer, with bits of smoked tofu or seitan. Goes well with almost any dish, be it vegetable or meat-based. Cabernet Sauvignon, Chianti classico, Sangiovese. If Auricchio piccante is too strong for you, replace it with the mild one! Here comes a suggestion on how to create savoury dainties with just a few, simple ingredients. The deep-fried pizza dough bits make a perfect base for these appetisers: you just need to add your favourite toppings, some Provolone cheese and bake everything for a few minutes.. Definitely something you must try out!